If SCEA Art Director Ken Feldman had his way, Kratos would be curb-stomping Helios and high-fiving Perses from a first-person perspective in the upcoming God of War III. Feldman originally pitched the game as an FPS to director Stig Asmussen, an idea that was promptly banished from the hallowed halls of Olympus. They made that game. It was called Legendary and it was terrible, proving that the mark of true genius lies in combining a fantastic concept with flawless execution. I think the God of War series struck that perfect balance from the get go, and have done a great job tweaking and tightening the sequels so they feel familiar but not repetitive. Not to mention suddenly switching from a third-person to first-person perspective would diminish the grandeur of some of the series’ more epic encounters. 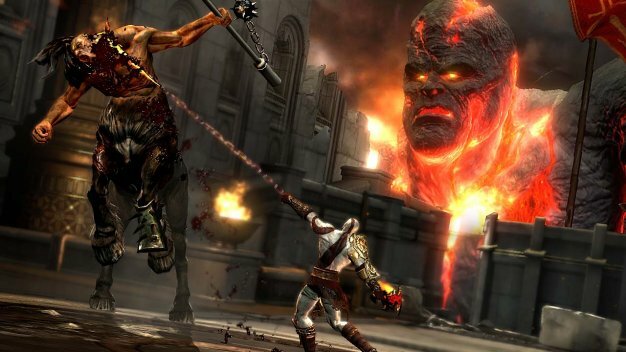 Seeing a muscle-bound badass like Kratos dwarfed in the shadow of the latest Grecian monster to be sprung from the pages of history gives an epic sense of scale to the ensuing battle, making it that much cooler when our rage-fueled hero rips its damn head off.